Notes: MasterSounds turntable weights are carefully designed to reduce a turntable's noise floor and thus improve the musical soundstage. Users enjoy improved bass response, tighter mids and controlled highs as the turntable weight reduces unwanted resonance when placed via the spindle on top of a record. These weights are just over 400 grams (+/- 14oz), light enough to not cause damage to a turntable's bearing system, but heavy enough to give sonic improvement. The weights have been tested on a large variety of non-suspended belt drive and direct drive turntables with great success. Pressing plants try to achieve quality control on every record made, however there are intrinsic issues such as dished and warped records. MasterSounds turntable weights help to combat this too. DJ's love this, as it aids cueing a problematic a record prior to mixing and eliminates needle skip. The weights have an anti-slip base, and thus each turntable weight has been designed to grip the record, which is fantastic for DJ'ing as it really stabilises records in the mix. Try using MasterSounds turntable weights for a couple of weeks, then remove to realise what a difference they make! No springs, clips or screws required, just place the Mukatsuku disc stabilizer over the spindle and hey presto, you can obtain tighter bass and sweeter treble, as well as improved dynamics/less distortion bringing the record into more intimate contact with the platter. No springs, clips or screws required, just place the Mukatsuku disc stabiliser over the spindle and hey presto, you can obtain tighter bass and sweeter treble, as well as improved dynamics/less distortion bringing the record into more intimate contact with the platter. Notes: Exclusive to Juno the Mukatsuku Carbon Steel Ring Record Disc Stabilizer is Europe's best selling label branded Ring Stabilizer specifically made for 7 inch dinked 45rpm records and can put used on its own directly placed onto the record before playing or in conjunction with most metal 45rpm adapters or the Mukatsuku 45 Twister. 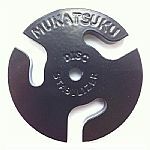 No springs, clips or screws required, just place the Mukatsuku Ring disc stabilizer on the record on the spindle and hey presto, you can obtain tighter bass and sweeter treble, as well as improved dynamics/less distortion bringing the record into more intimate contact with the platter. In this version a circular aluminium 45rpm adapter is included to use either in conjunction with the ring stabilizer on its own for any dinked 7 inch record. The Mukatsuku ring disc stabilizer is great for DJ use in a club environment or when recording from vinyl to digital. It may even possibly help dished records or skipping 45rpm 7 inch records. The weight keeps the record tight to the platter and is cut from 10mm carbon steel, and then coated in a black plastic powder paint finish. As used by Ollie from Herbaliser. In this version a black pattern 45rpm adapter is included to use either in conjunction with the ring stabilizer on its own for any dinked 7 inch record. The Mukatsuku ring disc stabilizer is great for DJ use in a club environment or when recording from vinyl to digital. It may even possibly help dished records or skipping 45rpm 7 inch records. The weight keeps the record tight to the platter and is cut from 10mm carbon steel, and then coated in a black plastic powder paint finish. In this version a chunky circular aluminium 45rpm patterned lazer cut adapter is included to use either in conjunction with the ring stabilizer on its own for any dinked 7 inch record. Notes: As used by The Herbaliser & Marcel Vogel....Exclusive to Juno the Mukatsuku Carbon Steel Ring Record Disc Stabilizer is Europe's best selling branded Ring Stabilzer |& is specifically made for 7 inch dinked 45rpm records and can be used on its own directly placed onto the record before playing or in conjunction with most metal 45rpm adapters or the Mukatsuku 45 Twister also sold exclusive at Juno.No springs, clips or screws required, just place the Mukatsuku Ring disc stabilizer on the record on the spindle and hey presto, you can obtain tighter bass and sweeter treble, as well as improved dynamics/less distortion bringing the record into more intimate contact with the platter. It also works on small hole 7 inch releases. Please take care with your stabilizer to prevent dents & chips by storing in a soft cloth when not in use especially when moving from one place to another. Pair of black record stabilizers/turntable weights/record clamps for your precious 45s - exclusive to Juno! Notes: Exclusive to Juno as used by USA DJ/Producer Kai Alce/ Marcel Vogel...etc.The Mukatsuku Carbon Steel Ring Record Disc Stabilizer is specifically made for 7 inch dinked 45rpm records and can be used on its own directly placed onto the record before playing or in conjunction with most metal 45rpm adapters or the Mukatsuku 45 Twister also sold exclusive at Juno.No springs, clips or screws required, just place the Mukatsuku Ring disc stabilizer on the record on the spindle and hey presto, you can obtain tighter bass and sweeter treble, as well as improved dynamics/less distortion bringing the record into more intimate contact with the platter. It also works on small hole 7 inch releases. Notes: The new version of the Mukatsuku disc stabilizer/record turntable weight - with the famous logo design - is great for DJ use in a club environment, or when recording from vinyl to digital. 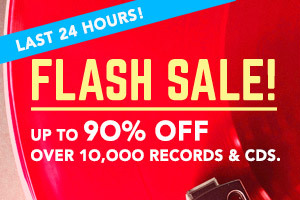 It may even help dished or skipping records. No springs, clips or screws required, just place the Mukatsuku disc stabilizer over the spindle and hey presto, you can obtain tighter bass and sweeter treble, as well as improved dynamics/less distortion, bringing the record into more intimate contact with the platter. Notes: STB-EP is a multi-function 45 record adapter with three amazing functions. The diameter of STB-EP has been designed and manufactured with an accuracy of microns. Its snug fit minimizes any eccentricities in the record for most accurate playback and no skipping under aggressive DJ use. Being made of heavy-weight metal, if offers greater stability and vibration resistance than a plastic 45 adapter. With ergonomic design, and a beautiful chrome finish, this easily removable adaptor fits almost any turntable on the market. With a large 25mm diameter level and easy to see blue fluid, you can also use the adaptor to easily level your platter, ensuring the highest quality playback, and smoothest possible tracking for your tonearm. An essential turntable accessory! Notes: The sound performance of a vinyl playback system can be significantly improved when all unwanted resonances between the record and the platter can be reduced during playback. Enter record clamps and pucks; simple devices which are designed solely to ensure the record and platter surfaces are held together tightly. Pro-Ject's Clamp-IT is one of the most competent solutions available. It is a stylish accessory with a clamp mechanism around the centre spindle, that will not add weight but will press the record against the platter. The Clamp-IT also allows you to fine-adjust the pressure depending on the condition of your warped records. Fitting of Pro-Ject's Clamp-IT is easily done, and once it's in place it won't only please your ears; because its beautifully machined diamond-cut edges will also stand out on any turntable! The sound performance of a vinyl playback system can be significantly improved when all unwanted resonances between the record and the platter can be reduced during playback. Enter record clamps and pucks; simple devices which are designed solely to ensure the record and platter surfaces are held together tightly. Notes: Tonar Misty Record-Clamp - transparent black. The Tonar Misty plate clamp is the perfect alternative if a "plate puck" is too heavy for your turntable. Notes: Tonar Misty Record-Clamp - transparent red. The Tonar Misty plate clamp is the perfect alternative if a "plate puck" is too heavy for your turntable. Notes: Any vibrations in the record during playback will be picked by the cartridge and will be reproduced by the amplifier and speakers causing muddy sound, distortion and reduced detail. In order to avoid record vibrations you must make sure that the contact between the record and the platter is as perfecrt as possible.The tonar record clamp presses the record flat against the platter. Put the record on the turntable and then put the clamp on the spindle, press down & turn the knob to tighten. The weight of the clamp is minimal so it can be used on any record player with a fixed spindle. Also many older manufactured records are warped to varying degrees, this causes big problems for the diamond stylus of the cartridge to track the grooves properly. The stylus pressure fluctuates as the stylus moves up and down while trying to track the warps. With bad results: muddy sound reproduction with distortions and if the turntables drive isn't really strong... audible flutter. In some cases the stylus may actually loose contact with the groove causing a hissing sound. Using the Tonarclampit will press the record onto the turntable platter, and the problematic surface will be flattened while you play the record causing a dramatic improvement of the reproduced sound on old records. Take care that the platter bearing of your turntable is able to accept the additional weight of 760 g. If in any doubt please consult your record player instructions or your dealer before buying or using this weight.